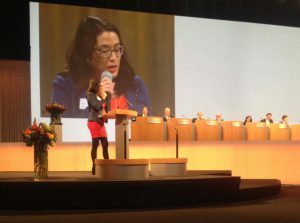 Accueil > News > 150th AGM of Nestlé: will the new CEO represent a real change of generation? My name is Camille Selleger and I speak on behalf of the International Baby Food Action Network, recognized as an essential partner by WHO, UNICEF and the UN. In this venue, many people already know us; I hope that our concern and legitimate request will be treated seriously. On behalf of our network, I would like to welcome you in your new role which is critical when it comes to child health. Last year, the Lancet highlighted that breastfeeding could save an additional 800,000 babies’ lives annually if rates would be increased. In addition, breastfeeding significantly reduces the risks of allergies, obesity, infections and malnutrition, and improves IQ. According to the international standards adopted to protect breastfeeding from commercial pressures, including the UN Convention on the Rights of the Child, Nestlé is required to comply with the International Code of Marketing of Breastmilk Substitutes and subsequent resolutions in all countries of the world, irrespective of their national legislation on this matter. However, Nestlé’s policy does not respect all of the Code’s provisions nor does it apply in all countries. While Nestlé’s inclusion in the Index FTSE4Good is cited in your report Creating Shared Value, we must stress that the criteria established by FTSE4Good make a distinction between countries based on the risk of infant mortality and malnutrition- a distinction that is not legitimate in the light of the recommendations of the World Health Organization. In addition, FTSE4Good looks to the companies’ policies, not to their compliance to the Code. Nestlé continues to violate the Code on a regular and systematic basis, including in those countries that you define as higher-risk countries, such as India, Mexico, Indonesia, Thailand, Bosnia, among others. These violations are described in the IBFAN report Breaking the Rules, recognized as a reliable source of information by WHO, and they justify that we maintain our boycott of Nestlé’s products. Mr. Schneider, you represent a change of generation within Nestlé and you want to reinforce your image as a company which supports good nutrition and optimal health: What is your action plan to align Nestlé’s policies and practices with the International Code and subsequent resolutions in all countries, in full and without distinction? Can you confirm that Nestle will abide by WHO’s new guidance on the marketing of baby foods, adopted last year? In reply to this question, the CEO of Nestlé, Mr. Schneider said that there are a lot of things that can be criticized but that the good things that Nestlé does every day, for millions of families and young children around the world, are not often sufficiently praised. He stated that in those countries where the Code has been put into law, Nestlé observes it, and it maintains his role of leader, working in cooperation with stakeholders involved in that field. He affirmed that Nestlé has found a good balance between the right of marketing practices and the way forward. He insisted on the fact that Nestlé is considered as a leader on this matter even by its competitors and said he would appreciate if other companies followed Nestlé’s example. Mr. Schneider, you know that even the WHO is highly concerned for the violations that occur nowadays and your company unfortunately is one of the greater violators of the International Code. This Code has been adopted in 1981 and has been complemented by a series of Resolutions, the last one adopted last year by the World Health Assembly. Beyond the nice words and the lot of work done by your company, there are concrete violations of this Code that immensely affect mothers and babies in this world. And if you want to be seen as a leader also in terms of nutrition and health I advice that you really take this challenge very seriously and that you adapt your Policy and practices. After IBFAN’s intervention, other shareholders made their speech, raised questions and asked the company’s leaders for clarifications on their annual Report. At the very end, and without leaving IBFAN a chance to reply, Ms. Christine Renaudin, already known for her unsympathetic reactions to the interventions of Patti Rundall from Baby Milk Action in the past AGMs, went up the stage to make her statement. She referred her experience in Uganda in 1998, during an AIDS epidemic outbreak, in which she had seen with her eyes children dying for the lack of infant formula. She said Baby Milk Action should send their trainees to Africa to see how infant formula is necessary and helpful when it comes to HIV. She stated that Nestlé saves lives and that IBFAN and BMA should stop demonizing it. She took a big applause for her speech. It is always interesting to observe how the company spins the meaning of unwelcome critics. First of all, Mr. Schneider repeated what is already known and did not show any perspective of change in Nestlé’s policies. Secondly, the object of IBFAN intervention here was Nestlé’s marketing practices and not the fact of producing infant formula as such. Ms. Renaudin should definitely pay more attention to the content of the speeches she is in charge of responding to.